It's Evoke's 10th birthday, and the Sensor Club opens its gates for a massive celebration. Four musicians and two VJs are teaming up on Friday the 10th of August to bring good vibes to the crowd from 9pm on. Jam through a night of electronic music and excellent visuals! 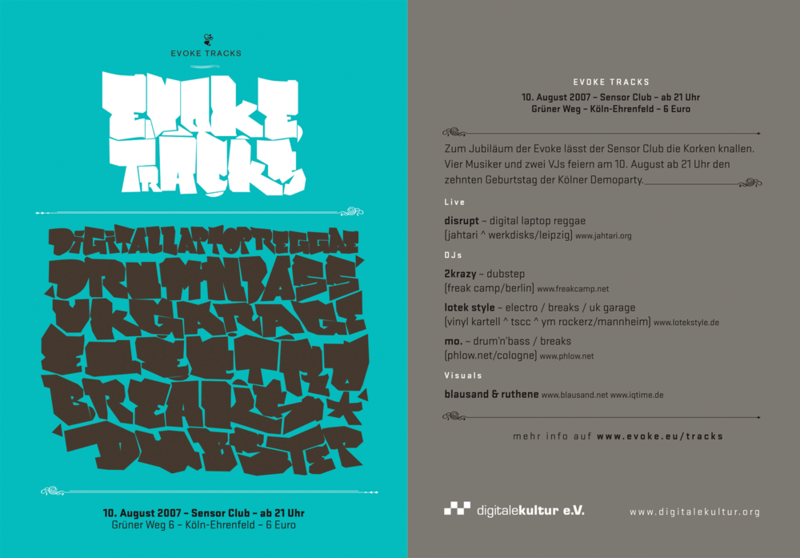 Already at Evoke 2004 the Sensor Club, back then located under the legendary Essigfabrik, brought you the Evoke Netlabel Night. Three years later, there is Evoke Tracks, featuring bass-heavy electronic vibes from digital Dub over Drum'n'Bass to Dubstep & Garage. Entrance fee for the whole ear- and eyepleasing night is 6 euros, while Evoke visitors get in for free. Visuals by Blausand and Ruthene.